Home › Barcoding News › The New Star SM-S220i Is Now Available! In addition to two Bluetooth radios, the SM-S220i also includes an extra serial port that enables the connection of external devices such as a PIN-PAD or RFID module showcasing its superior versatility. The two inch wide format SM-S220i supports printing of graphics as well as 1D and 2D barcodes. 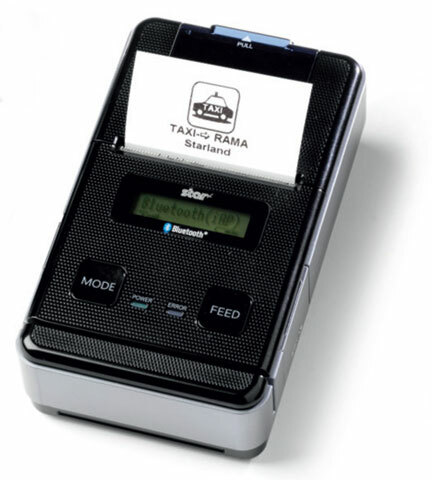 Company logos and QR codes can be easily printed with the SM-S220i making receipts eye-catching and interactive. Furthermore, the SM-S220i has three threaded holes in the back so that it can be mounted on a wall or counter. Coupled with its ability to drive an external PIN PAD or RFID module, this mounting ability makes the SM-S220i perfect for applications like printing receipts on a small, mobile food cart or mall kiosk where the printer is fixed but space is at a premium. The SM-S220i has a battery life up to eight hours; a perfect combination of small and compact size with long battery life. To extend the battery life the SM-S220i enters a sleep mode when not in use. An LCD screen is utilized to easily check battery level and Bluetooth mode. The SM-S220i model comes with a 1-year limited warranty. For any questions or to get a new SM-S220i ordered, contact us at BarcodesInc.